If you thought the grind was coming to halt in Destiny 2, think again. 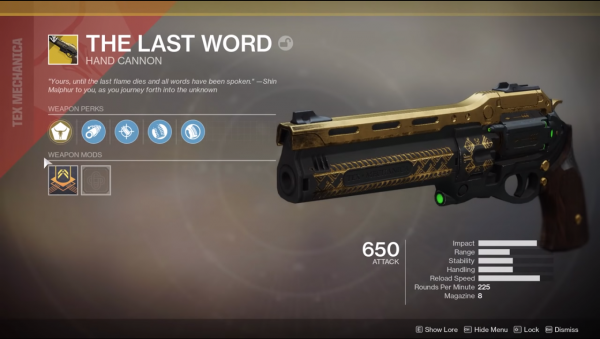 Yesterday’s 2.1.4 update brought with it a new Exotic quest, The Draw, which offers Destiny 1 favourite The Last Word as its reward. Once you’ve got your hands on The Last Word, check out our guide to find Thorn. 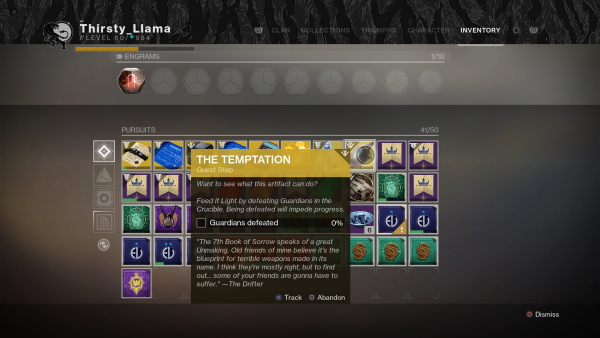 For the first part of this quest, you’ll need to visit The Drifter in the Tower and he’ll give you a Hive artifact that needs cleansing. For this quest step, you’ll need to collect 75 Hive Tablets, defeat Hive with Solar damage and kill three Hive bosses. The Hive tablets drop when you kill them, though for me they only dropped them if I killed them with Solar weapons, melee or with my Super. Your best bet is to head to Mars and take part in Escalation Protocol, as it has to be a large, named enemy for it to count as a boss. Once you’ve done that, go back and speak to The Drifter which completes the next step, A Cleansed Artifact. Here’s where things start to get a little tricky. Now that the artifact has been cleansed, it hungers for Light, so you need to complete in the Crucible. You’ll get one percent for every kill or assist you get, but if you do you will lose progress. Killstreaks will also add to your numbers, so just try your best. This step is terribly unforgiving if you don’t play a lot of PvP in Destiny 2, though it is doable with the right set up and a lot of patience. Mayhem is available in the Crucible and is a great way to rack up kills quickly by unleashing Supers whenever possible. Otherwise, keep a shotgun or pulse rifle to hand and time your shots. Once you’ve killed enough Guardians in the Crucible, you’ll need to head over to Titan to the Cargo Bay 3 Lost Sector in search of a special Hive Acolyte. This Acolyte is surrounded by Guardian Wizards, so you’ll need to defeat them first to lower his shields. Keep doing this until the room is cleared and the Acolyte is defeated, and the quest step will update to show a damaged helmet. Go back and see The Drifter and hand over the helmet that’s been pierced by a mysterious bullet. This is where the lore of The Last Word starts to tie in with Thorn. Have a chat with The Drifter and he’ll give you the next quest step. This is probably the most difficult and the longest step in The Draw questline. The Hive weapon master is creating new Weapons of Sorrow – which we could take to be a new and improved Thorn – and you need to stop it. Earn multiple Best Served Cold and Blood For Blood medals in the Crucible. Blood for Blood is earned when you kill an enemy that just killed one of your teammates, and Best Served Cold is earned by killing the last person who killed you. You’ll need to earn 25 medals in total to complete this step. Again, Mayhem would be your best bet to get this done as quickly as possible. As for the other parts of this quest, you’ll have to visit Lost Sectors on Titan, Mars, Tangled Shore or the Dreaming City to look for Wanted escapees. You’ll also need to kill Hive with precision shots, so get your scoped weapons out to get some headshot damage. You can revisit Cargo Bay 3 on Titan for this step, and the Core Terminous Lost Sector on Mars. You’ll also need to complete the Summoning Ritual Public Event on Titan or Mars. 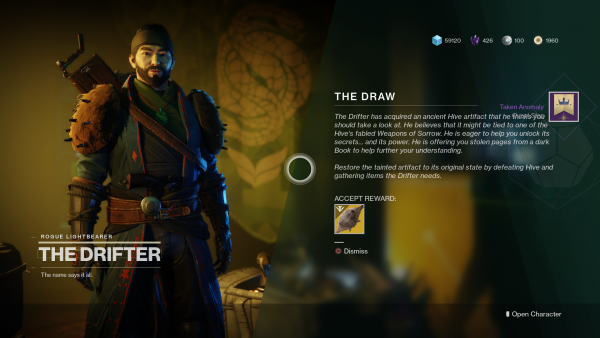 Once that’s all done, head back to see The Drifter to get the final step in The Draw Exotic quest. You’ll be hunting down Enkaar for this step, so head over to the Tangled Shore. You’re looking for Hellfire Canyon, which can be accessed through Jetsam of Saturn. Interact with the flag to begin The Conversation quest step. Respawning is restricted and the Suppressed Light debuff will be active, so you’ll only be able to regain health by picking up wells from defeated enemies. Defeat the waves of enemies and an Ogre will appear. Once it’s down, it will drop a worm. Pick the worm up and run to the blocked passage to blast it open. If you take too long, the worm will explode. In the next room, kill the three Wizards then jump down the hole and stand on the plate. Once you stand on it, the Steady prompt will appear. You need to wait for it to charge, and for the prompt “Draw!” to appear. The Last Word should appear beside you. Grab the Last Word and wait for Enkaar to lift his weapon. Use Last Word to shoot the gun out of his hand, then defeat the wave of enemies on your way to the next plate. This time, two copies of Enkaar will appear. Make a note of which one appeared first, as they’ll ready their aim in that order. Again, use The Last Word to shoot the gun out if their hands, but be quick as the game will make you start again if you’re too slow. Go back and see The Drifter who’ll give you a telling off for having such a weapon. He mentions that you can trust him, but not the guy who gave you The Last Word, who just so happened to be his friend’s killer. Check out our guide for unlocking the Mysterious Box and getting your hands on Izanagi’s Burden, as well as how to complete the Lost Souvenir quest. If you want to learn more about what Pinnacle weapons are available or want to find some the secret Emblems, check out our Destiny 2: Black Armory guide here. For those of you whoa re new to Destiny 2, check out our Destiny 2: Forsaken guide here for tips on how to boost your Power, unlock Supers and more.